On this page from Ben and Le-Anne's wedding album we have more of a traditional spread. The upper left image on the left hand page shows the vehicles that the groom and ushers used to travel to the church. This was shot with a wide angle lens and a Nikon D4s camera. The lower left image shows the ushers adjusting each others ties in a natural way, which is a favourite style of wedding photo with me. I much prefer taking natural wedding photos than stages ones! 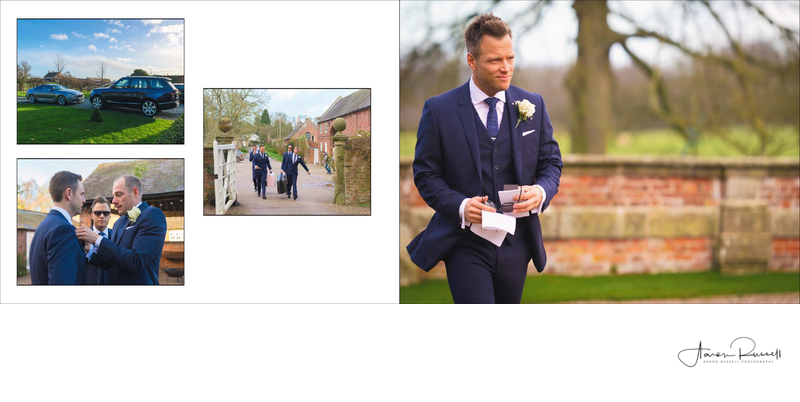 To the right of these two images we can see the groom, best man and ushers all arriving at the wedding venue together. The right hand page features a full-page spread showing the groom walking down the long path towards the church. I really like this image of the groom because you can really see a look of anxiety on his face, as surely every groom feels at some point in the run up to their wedding on the big day. I chose to take these photos with a long telephoto lens in order that I could keep my distance from the people in the photos, allowing them to act more naturally than if I were more directly in their line of sight.